More often than not, when you want to figure something out, how do you do it? You Google it. Your second action usually leads you to an article or a YouTube video. Chalk-full of how-to videos, beauty tutorials, music videos, animals doing cool stuff, the news and lectures, YouTube allows people to turn their passion into a YouTube phenomenon. And what’s really cool about that is people are also using YouTube to turn their passions into reality. Growing up in the 2000s, Miranda Hanson belongs to the first generation born in the Internet age. She was five years olds when YouTube was created. And at first she enjoyed watching beauty and fashion tutorials, then Miranda began using YouTube videos to teach herself how to sew. She remembers watching ThreadBanger videos the most. ThreadBanger is still around today boasting 3 million subscribers. They specialize in curating the best how-to, crafting and DIY videos. Miranda’s love for sewing grew when she received her first sewing machine from her grandmother at the age of eight. Miranda showing off her personal style. It wasn’t until high school that Miranda says she was ready to share her designs with everyone. Once she started wearing them to school, her friends wanted to know where she bought her clothes. Now she’s making at least five Homecoming or Prom dresses every year plus people who come to her for alterations, and she’s only 16. Miranda also stays busy sewing costumes for her school’s one-act plays. Parrot costume designed by Miranda for Noah's Ark one-act production. Miranda is showing her first ready-to-wear collection at Fashion Gala Events Fall Show on November 11. It is inspired by her style, which she says changes every day. “I really like California style. I dress up quite a bit and like looking nice. I wear a lot of rompers and dresses,” she tells me. She’s also using fabric manipulation to accent some of the pieces. She takes strips of fabric and twists them around each other like origami. 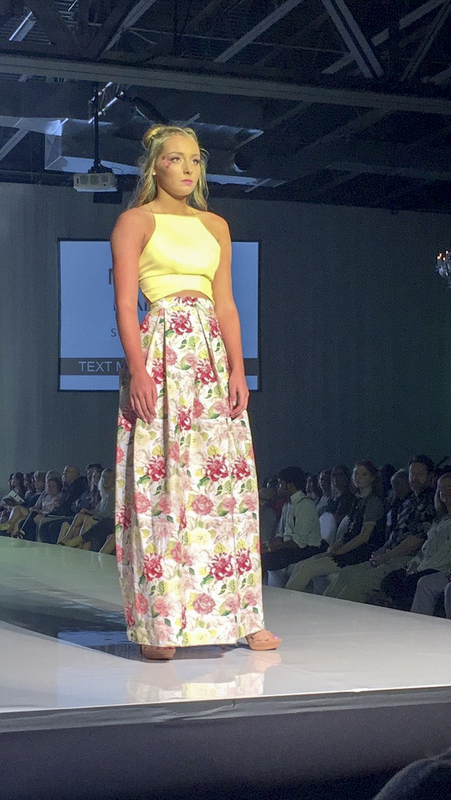 Expect to see yellow and pink pastels as well as floral print throughout. For her next collection, Miranda says wants to do 12 ready-to-wear looks, which is three more than she’s doing this season. Still undecided on the inspiration, she is thinking of doing monochromatic black and white. Miranda plans to study fashion when she graduates in two years. 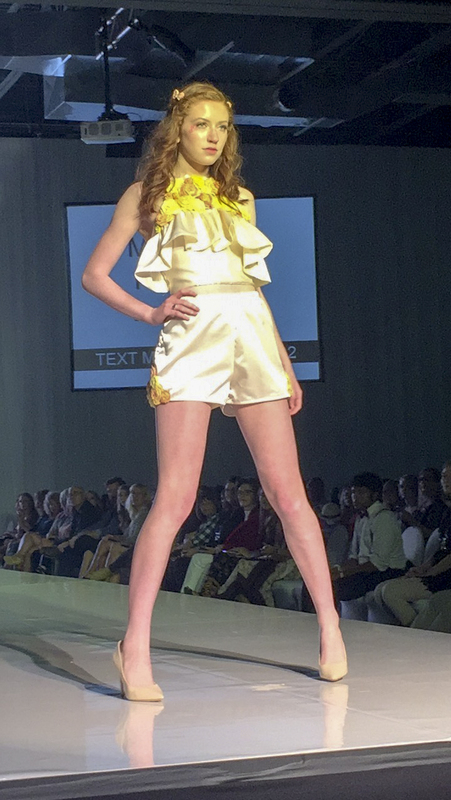 She’s torn between the Fashion Institute of Design & Merchandising (FIDM) in LA or enrolling at a public university to get the college experience. She hopes an internship next summer will help her sort it out.